"Fill a wide mouthed bottle with hot water nearly to the brim, and press affected part of hand tightly against mouth of bottle. The suction will pull down the flesh, and steam will soon draw out the splinter." 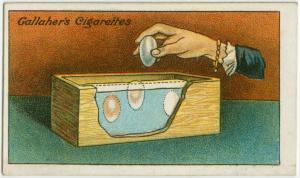 "Eggs for preserving must be newly laid, and by simply putting these into a box or tin of dry salt-burying the eggs right in the salt and keeping it in a cool dry place — it is possible to preserve them for a very long period. No air whatever should be allowed to get to the shell." 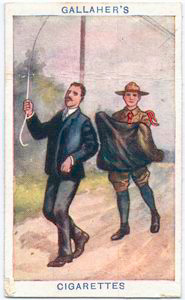 "A scout's staff, a walking-stick, or even a handkerchief or hat may be held before you as shown. The dog invariably endeavours to paw down your defense before biting, thus giving you the opportunity of disabling him by a kick." 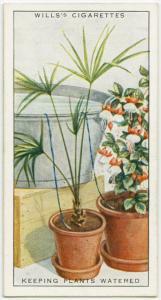 "Fill a large pail with water, and stand it a little above the level of the plants and group round or near as many plants as practical. Loosely plait two or three strands of wool together, immerse completely in water, and place one end in the pail, weighted, and touching the bottom. 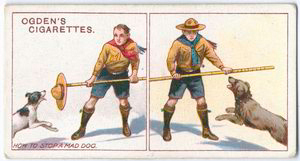 Rest the other end on the soil: a separate plait of wool is advisable for each pot." 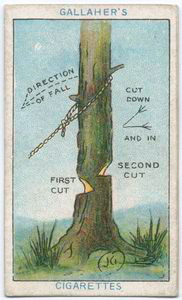 "The familiar difficulty of lighting a match in a wind can be to a great extent overcome if thin shavings are first cut on the match towards its striking end, as shown in the picture. 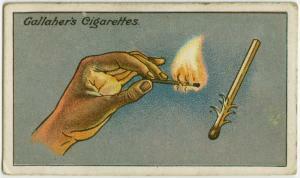 On lighting the match the curled strips catch fire at once; the flame is stronger and has a better chance." "Fasten a strong rope to a tree and let a boy swim across the stream and fasten the other end to a tree on an opposite bank. 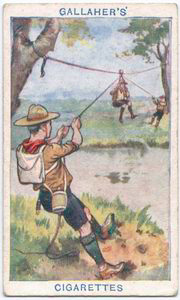 Make the chair, fasten it to a running loop or a block pulley, and by means of a light rope fastened to the middle of (the) chair and held by a scout at each end, those unable to swim are safely passed over." "In rescuing a person touched by a "live wire" do not attempt to take hold of him if he is still grasping the wire, unless your hands are protected by rubber gloves, a water-proof coat, or several thicknesses of dry cloth. 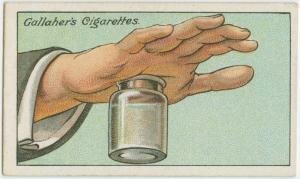 Stand on glass or dry wood, and try and have (the) current switched off, and send at once for a doctor." "A most handy and efficacious filter can be made out of an ordinary perfectly clean zinc water pail, through the bottom of which a hole has been drilled and a small pipe fitted. 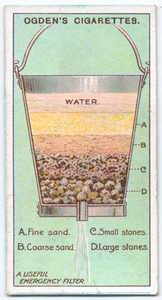 The water percolates through the layers of fine and coarse sand, and clean picked gravel and stones, with which the pail is filled, filtering through to the bottom in a clear state." 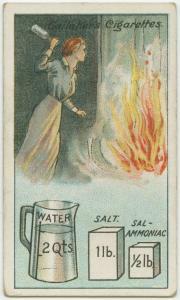 4 responses to "Life Pro Tips from 100 Years Ago"
Nice job, i didnt know about matches, water filter and first thing!! HOW TO KEEP PLANTS WATERED.. perfect timing. I'm leaving for holidays for almost two weeks! Enormous posting here. I am very amazing by readout this site which was very necessary for me and for my friends thanks a lot for giving this point in this site. I may be come to you to know more details about this theme.